Royal Marines arrive in Canea. 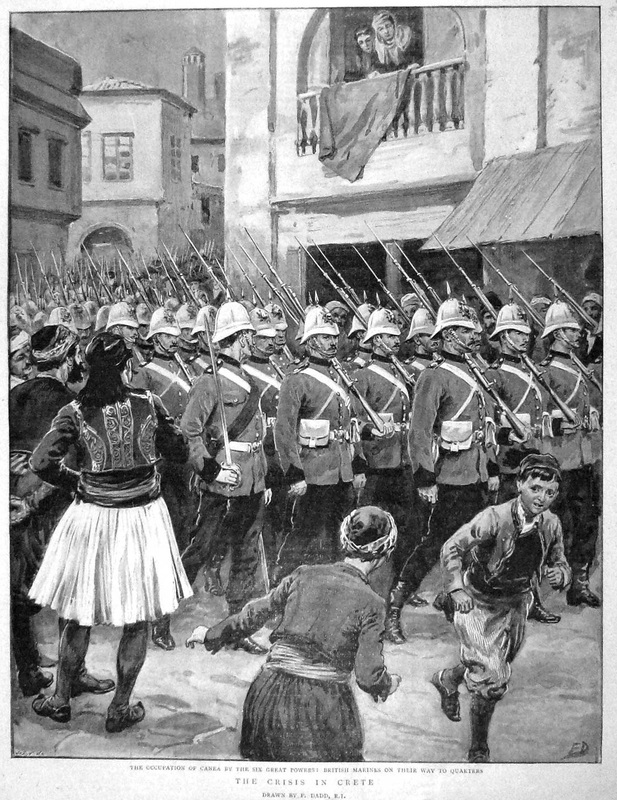 | The British in Crete, 1896 to 1913. Royal Marines arrive in Canea. According to The Times correspondent present, at 3.15 p.m. on the 15th February 1897, a launch from H. M. S. Revenge, the flagship of the British Mediterranean Fleet, entered Canea harbour in the charge of Lieutenant Nelson and Sub-Lieutenants Addison and Hunt, landing a detachment of marines who then drew up upon the quay. 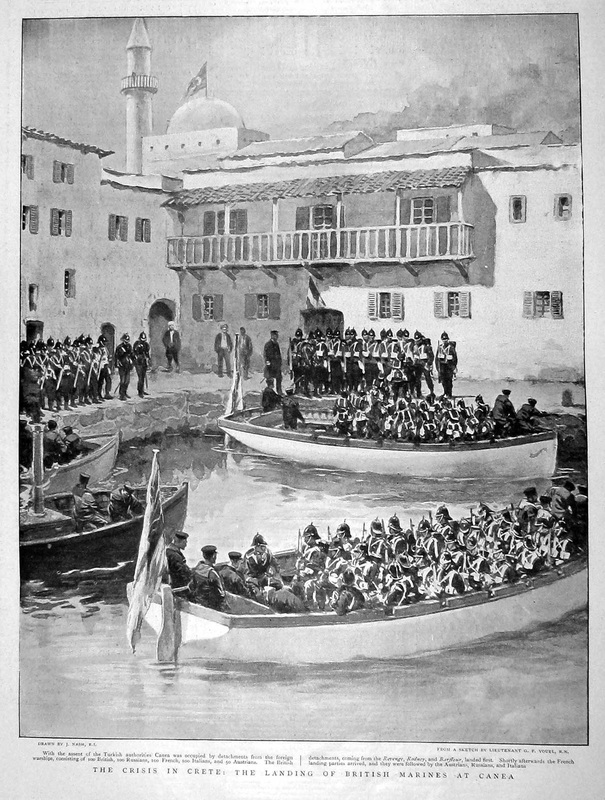 They were met by British consul Sir Alfred Biliotti and Vice-Consul Cassimati, as well as Major Bor, British Commander of the ‘new’ Gendarmerie and Lieutenant Colonel Herbert Chermside; the latter on the island since 1896 in his capacity as a member of the Gendarmerie Commission, the Concert-lead Commission for the reorganization of the gendarmerie. Launches from H. M. S. Rodney and H. M. S. Barfleur followed shortly afterwards as did French landing parties; boats from the Austro-Hungarian, Russian and Italian ships arriving later. Royal Marines landing in Canea. 15 February 1897. With the consent of the Turkish authorities Canea was occupied by detachments from the foreign warships, consisting of 100 British, 100 Russians, 100 French, 100 Italians, and 50 Austrians. The British detachment coming from Revenge, Rodney and Barfleur landed first. Shortly afterwards the French landing parties arrived and they were followed by the Austrians, Russians and Italians. There is no record as to whether or not the Marines went commando. This entry was posted in Royal Navy in Crete and tagged Canea, Crete 1897, European Intervention Crete, H.M.S. Barfleur, Royal Marines on November 23, 2014 by Mick McT. Pingback: Naval Patrol | The British in Crete, 1896 to 1913.